The two very distinct personalities of this pretty lake trail make it as entertaining to hike as the movie “Victor, Victoria” is to watch. On the western shore, the trail’s temperament is clearly mellow and rambling – with a wide flat trail, grassy expanses, and reflective lake views. 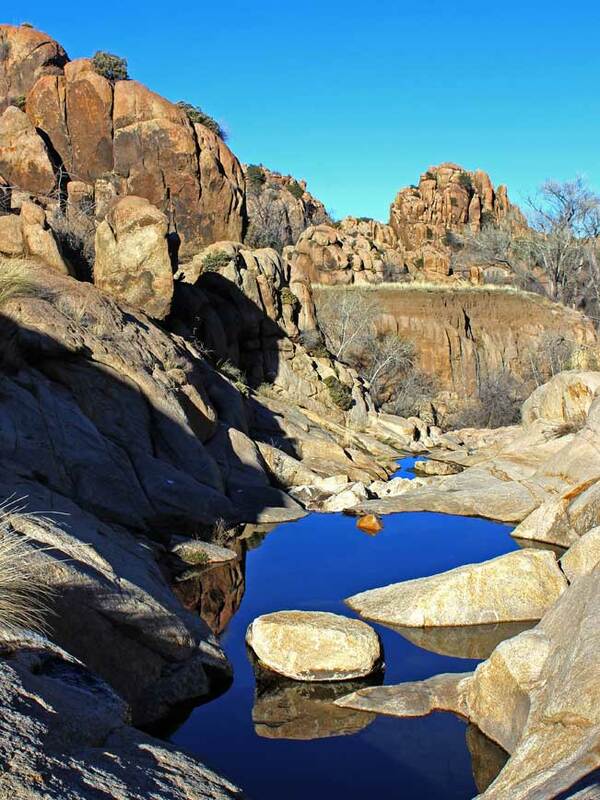 The eastern shore, by contrast, is rambunctious and playful – with billowing boulders to scramble over, small hidden canyons to explore, and broad views of Prescott’s iconic granite dells. 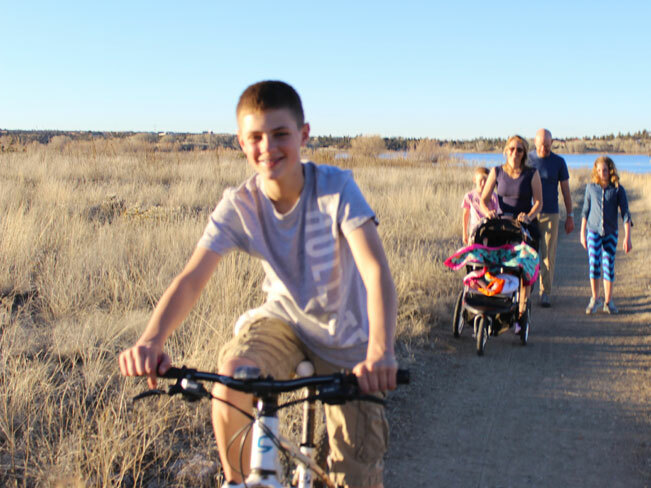 Whether you opt to hike the full 5.2 mile Willow Lake Loop Hiking Trail, or make use of just one shore (heading right from the parking lot to hike the smooth western shore, or left to enjoy the bouldery route), the hike makes for a great day out with friends or family. The lake itself is scenic, offering dazzling views of kayakers, wildfowl, sculpted stone slopes, and Granite Mountain on the horizon. Starting the Willow Lake Loop Hiking Trail from the lake’s smooth western shore you’ll pass joggers, families on bikes, and folks out walking fido. The trail makes an easy curve around the lake, traversing grassy shores with meditative lake views. As you reach the southern-most-end of the trail (at about 2.5 miles) the grasses rise up and the ground gets a bit marshy, so expect some mud. After a heavy rain this short portion of the trail sometimes becomes impassable – as the bog expands (to the duck’s delight!). 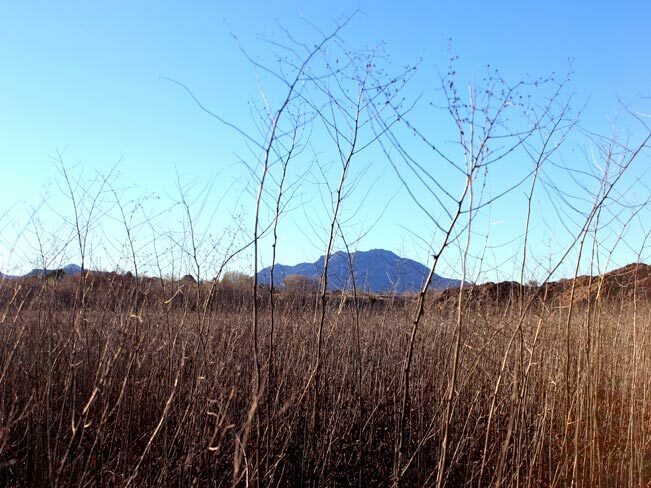 Passing this southern bog the terrain quickly takes on the Willow Lake Loop Hiking Trail’s more playful personality. You’ll begin ascending and descending a series of rolling granite dells, each with its own pristine view of either the lake and Granite Mountain to the west, or infinite granite boulders (which appear scattered by a giant’s hand) to the east. There are glimpses into quiet harbors, full of waterbirds, views of the small dam that retains the lake, petite hidden canyons (some speckled with reflective pools) and an endless array of gigantic rolling boulders to climb on. 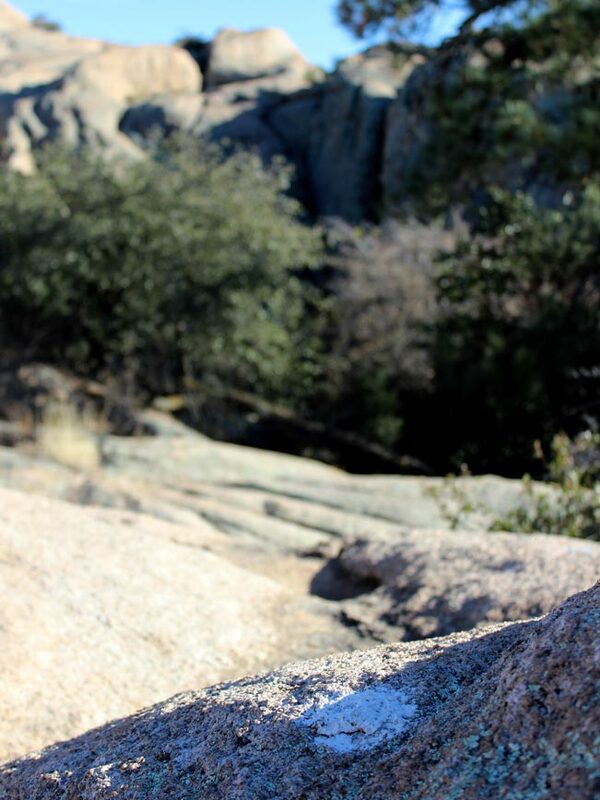 The trail is marked by white painted dots that lead you over the rock-scape. Finally, exiting the undulating stone canyons, you’ll encounter a lovely treed area on the northern-most-tip of the lake. It is a great spot to take a deserved break before heading back to the car. There are picnic tables, a short dock, and even a small sandy beach. As mentioned, the Willow Lake Loop Hiking Trail can be taken from either direction, depending on whether you prefer to start with the mellow personality or the rambunctious one. Willow Lake was created in 1925 to harness water for local alfalfa crops. Directions From the intersection of I-17 and AZ-69N (I-17 exit 262) take AZ-69N (towards Prescott) for 21.6 miles to the intersection of North Fain Road/AZ-89A Spur. Turn right/north onto AZ-89A Spur (which becomes AZ-89A and then Pioneer Parkway) and drive 14.7 miles to Willow Creek Road. Turn left/south on Willow Creek Road and drive 1.1 miles to Heritage Park Road. Turn left on Heritage Park Road and continue 0.2 miles to the trailhead parking lot.